Arctic Watch Lodge and Belugas – The Great Canadian Travel Co.
Venture north from Yellowknife to the amazing Arctic Watch lodge, where you will have one of the best personalized experiences with some of the world’s most legendary wildlife. Nunavut will truly come alive right before your eyes! Contact us for up to date availability. Prices are shown as starting from prices, per person, in CA$. Arrival to Yellowknife, the capital of Canada’s Northwest Territories and spend the night at the Explorer Hotel. Early in the morning, at the hangar in Yellowknife, Arctic Watch guests meet the private chartered plane that will fly them the 1,000 miles (1,500 km) to Arctic Watch. Your wallet is no longer of any use, your worries from the south are behind you, this the start of your Arctic adventure. The plane is a modern and comfortable aircraft. You will pass from trees, across the treeline and over the barrens; it’s time to sit back and relax. You will also pass over the impressive holes in the earth dug for the Diavik mine. Food will be served during the four-and-a-half-hour flight north. After one stop for refuelling in the community of Cambridge Bay, we will land in the afternoon on our private airstrip next to Arctic Watch on Somerset Island. 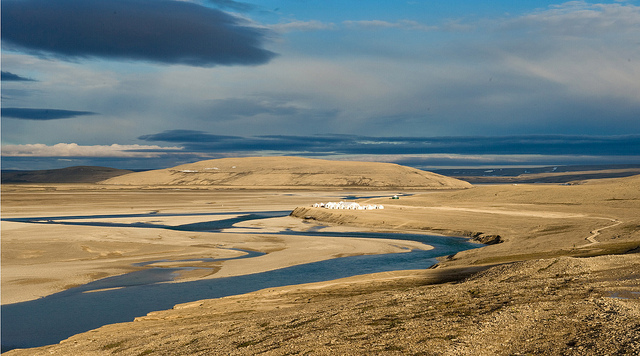 A short walk across the tundra, and an even shorter raft ride across the Cunningham River, brings guests to the lodge. Following a tour of the Arctic Watch facilities and some time to get their luggage settled in their cabins, we will assemble in the great room for a welcome and to meet our staff. Dinner is later served in our cozy dining room. Breakfast is served at 8:30 daily at Arctic Watch Lodge. Time is precious in the High Arctic and every day brings something different! Today you will receive a hands-on introduction to driving all-terrain vehicles (ATVs), which are easy and fun to drive. A short-distance hike to the Cunningham River estuary to watch beluga whales frolic in the shallow water only a few yards offshore among the ice floes is followed by a lunch buffet that includes: hot and nutritious soups such as French-Canadian pea, leek, smoke tomato, potato and cream of corn; freshly baked sourdough and rye breads; specialty meats and cheeses; fresh vegetables; and homemade desserts. In the afternoon, we will hike to Triple Waterfalls, a five-story torrent of free-falling water. You can see nesting peregrine falcons and other birds such as loons, snow buntings, sandpipers and rough-legged hawks. Exploring the canyon introduces you to the tiny beauty of wild Arctic flowers. 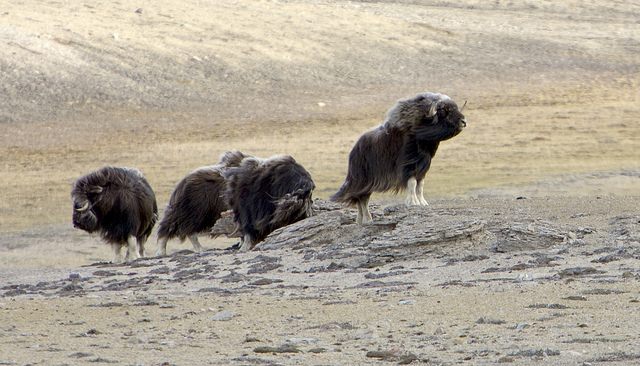 Encounters with muskox are common. All of these daily activities and hiking builds an appetite. Hearty evening meals typically include a main course of baked Arctic char, grilled muskox, barbecued pork tenderloin or other meats. Side dishes of oven-roasted vegetables, red and white wine, fresh bread, and homemade desserts round out the meal. In the evening, there’s free time for local exploration. The library has a broad selection of Arctic and polar titles. Our interpretive centre contains collections of local fossils, skeletal remains of Arctic fauna, and a collection of traditional Inuit skin clothing from Canada, Greenland and Siberia. Breakfast, served at 8:30, typically includes fresh coffee, home-baked pastries, muffins, cinnamon rolls, fresh fruit, yogurt, muesli, French toast or pancakes with Quebec maple syrup, eggs, double-smoked bacon and sausages. You will travel by ATV, crossing the Cunningham River delta, then driving along the Muskox Ridge Trail, which provides a scenic overview of the entire area. To date, every excursion to this location has resulted in a muskox encounter. 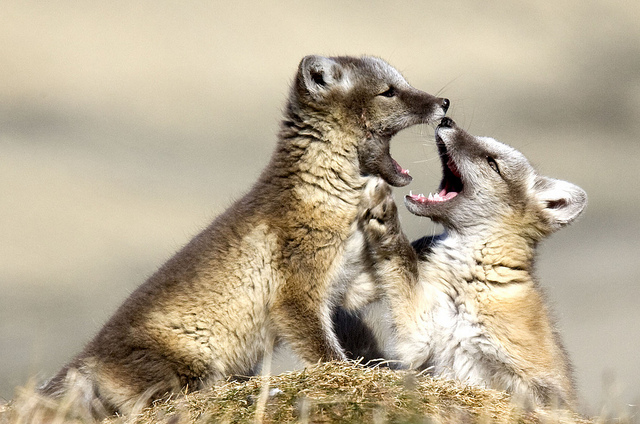 Passing an impressive Arctic fox den, you may have the opportunity to watch fox cubs at play. Following a picnic lunch at our own Arctic Watch shelter at Inukshuk Lake, gear is supplied and guests have an opportunity to “catch-and-release” fish for Arctic char. Returning on ATVs, the tour takes an alternate route via the River Trail so you can view hoodoos (sculptured sand pillars) and local coal deposits. That evening, Richard Weber, internationally recognized polar explorer and owner of Arctic Watch, offers an informal lecture on his North Pole adventures. His historic 1995 unassisted journey to the North Pole and back ‘a feat that has never been repeated’ is highlighted. Monday’s focus is on sea kayaking in Cunningham Inlet. All equipment and basic instructions are provided. 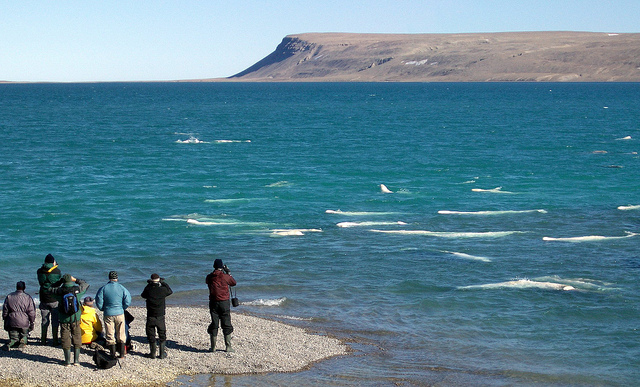 You will paddle among icebergs, ring seals and bearded seals while watching for beluga whales. Sightings of sea birds, including Arctic terns and eider ducks, can be expected. Lunch is served on the shoreline, with a small hike to explore a local canyon aptly named “Kayak Falls”. Here you will have stunning views of the Northwest Passage and the opportunity to see polar bears. In the afternoon, we return to the Cunningham River estuary to watch the beluga whales. This site is unique in the world because of the density of the whale population and their proximity to us. 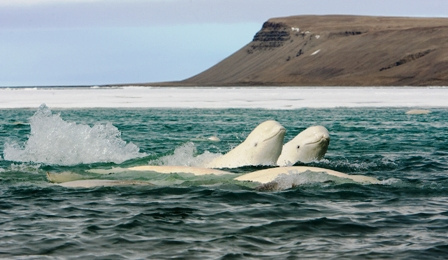 While standing on the river banks, the beluga whales frolic in the shallow water and come within several yards (metres), close enough to clearly hear their communication calls. To better appreciate the underwater calls, a hydrophone (underwater microphone) is used. Beluga whale researchers from Mystic Aquarium will be based at Arctic Watch. The resident scientist(s) is a resource to visitors during the day by the whales. In the evening there is a lecture on the beluga research being conducted in Cunningham Inlet. Following breakfast, you will depart, crossing the Cunningham River delta, for a trip to Flatrock Falls. Here you have the option of hiking or travelling by Mercedes Unimog truck. Somerset Island canyons, which guests will visit, are as yet unnamed. They were formed as the result of shifting fault lines and their walls, mostly vertical, vary from 200 to 1,000 feet. Millions of fossils of prehistoric plants and animals litter the ground. Today’s trip also offers opportunities to observe nesting sites of local birds, including terns, plovers and snow geese. A picnic lunch is served directly on the flat rocks that surround this canyon. After lunch, we will travel to Gull Canyon, named by Arctic Watch owners Richard and Josée Auclair, where we will see the striking biological contrasts between barren canyon and lush gull rookery. The Canadian Wildlife Service recently visited this spot to view the gull rookery and observe the presence of peregrine falcons. They claimed this spot to be a unique and special micro-ecosystem. In the evening, Arctic Watch’s house scientist will give an informal lecture. Today’s excursion is by ATV to Cape Anne. We will visit five Thule sites along the coast and look for polar bears. The ride includes scenic vistas, icebergs, ancient Inuit campsites and prehistoric giant whale bones. The Thule culture was a bowhead-whale-hunting culture, ancestors of today’s modern Inuit. The Cape Anne Thule site is the largest in the area and includes the remains of 15 stone and bone houses. Polar bears can be often seen on the shoreline, as they wander the coast, waiting for the ice to return. The return trip is overland via the Red Valley and guests can expect to be inspired by the magnitude of the landscape. At the end of a long day, we will enjoy another delicious dinner at Arctic Watch. This evening you can relax with a lecture by Richard Weber. His presentation includes stunning images and fascinating stories of Arctic expeditions to Baffin, Ellesmere and other High Arctic islands. We begin this final day at the lodge with one of Josée’s hearty homemade breakfasts. The first leg of today’s journey is covered by Mercedes Unimog truck. 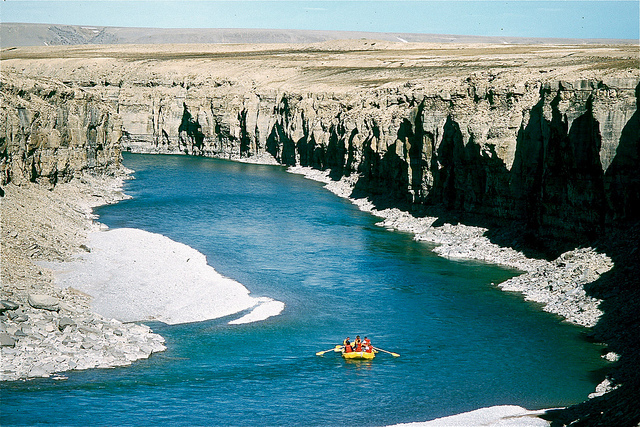 We will reach the Arctic Watch raft and kayak put-in on the Cunningham River, 20 kilometres from the lodge. Typically, the final six kilometres require a hike through the Badlands, passing the skeletal remains of two bowhead whales dated at eight thousand years ago. The voyage includes encounters with muskox, snow geese, jaegers, Arctic foxes, sandpipers and rough-legged hawks. While we savour a picnic lunch on the beach beside the river, staff prepare the rafts and kayaks. On the return to Arctic Watch, you have the choice of paddling your own kayaks or travelling by raft. The river is swift-flowing crystal-clear water with no difficult sections or rapids. The views are amazing and include steep canyon walls and, at one point, a 180-degree turn. You can expect to be on the water for two to three hours. Tonight brings our final dinner and evening at Arctic Watch. Note: Depart from Yellowknife for home today for those on the 8 day program. By your last day in the High Arctic, you will be familiar with the area of Somerset Island occupied by Arctic Watch. If there is an activity that you missed during the week or one that a you particularly enjoyed and want to repeat, there is time today to do these things. 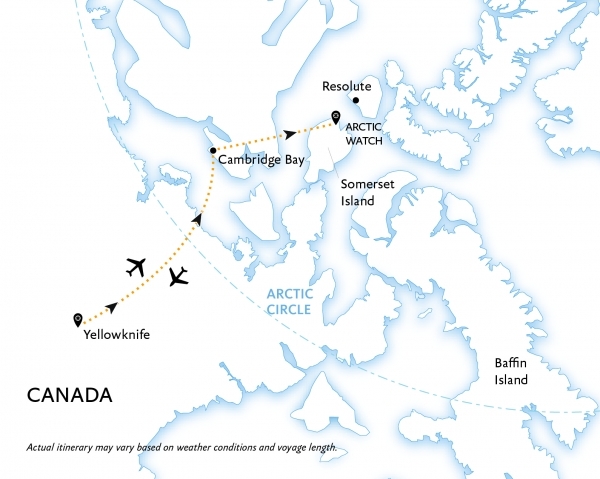 In the late afternoon, the plane will arrive to take guests back to Yellowknife. Overnight. You can choose to spend some time visiting Yellowknife or catch a flight south.